With an elegant and unique stand, displaying Castro Lighting’s greatest collections and newest designs, the brand introduced the Perfect Luxury Fusion, a concept developed to celebrate the brand’s 40th anniversary, where pristine lighting and lifestyle designs come together to create incorporated and composed ambiances. 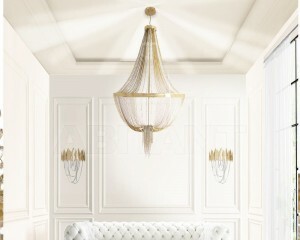 Gatsby’s powerful yet smooth lines create an organic movement of lights and shadows that suggest elegance and glamour. The sumptuous lamp handcrafted in gold plated brass, combined with beautiful Swarovski crystals, will stand out in the most luxurious and exclusive interior décors. This piece was conceived to be distinctive and stand out for its design, becoming the perfect fit for curated interiors that combine a diversity of styles. 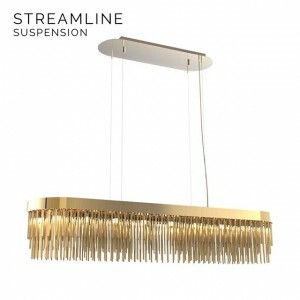 This elegant suspension features long gold plated brass tubes that give the design a whole exclusive and deluxe look, setting another level by its distinctive appearance. This recipe of rich materials and sleek lines inspired by art-deco architecture make the Streamline suspension desirable.